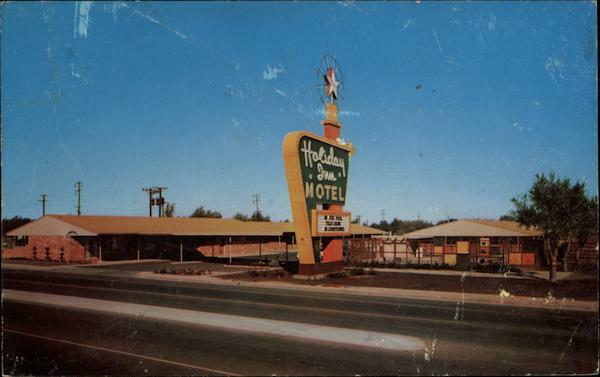 In early 1956 Holiday Inn was just beginning to take over as the dominant motel chain. The first Holiday Inn Hotel Courts location opened by Kemmons Wilson at 4941 Summer Ave. in Memphis, Tennessee in the summer of 1952. Well I expect you are at the Doctors now, as it is Friday eve. This place is the nicest we have had, all new. I wish you could see it. Within two years three more locations would open in Memphis and a few locations across several states. By the end of the decade Holiday Inn and their glorious Great Sign would come to dominate the American roadside landscape. This directory, printed for 1956, shows the chain in its relative infancy. I took the directory and distill it into a few different parts. The first image is the directory entry, the second is a postcard image of the site and the final piece is a view of the location now. Some of the information was rather difficult to find. I did the best I could to find accurate information on these locations. If I missed something or got something wrong please let me know. U.S. 280 at Junction State 147, on Florida Short Route 3 1/2 miles north of Auburn, a beautiful college town. Restaurant, television in every room, air-conditioned, swimming pool, telephones in rooms. US 11 South, Birmingham’s only resort hotel. Near ball park, stadium, fairgrounds. Guest privileges Holiday Beach. Complete convention, sales meeting, exhibit facilities. “Restaurant of Distinction,” drug store, barber, playground, kennel, lawns, service station. On U.S. 11 South – 9 1/2 Miles West of Downtown Mail Address – Box H – Bessemer, Alabama 16 minutes from downtown Birmingham, 7 acres of comfort and pleasure. 110 air-cond. rooms all on ground floor, parking at bedroom door. Restaurant, Cocktail Lounge-Bar. Children’s playground, swimming pool, other resort activities. Color TV. Part of the building is still standing. The back row of rooms has been long since torn down, the pool filled in and the restaurant building is no more. However, if you look at the satellite image you can see the footprint of the old Holiday Inn. A dive motel known as the Hiway Host currently occupies what is still standing. In US 65 at Junction with City Route 65. Swimming pool, restaurant, convention facilities, all beds king-size, tile shower and tub combination, room phones, TV, year-round central air conditioning with individual controls, Baby sitters; kennels. Much of the HI shell still stands. The back rows and part of the front motel building are gone. It is currently Classic Inn. On US 85-87 (Denver Highway) at 5700 North Nevada, two miles north of the city. 104 luxurious rooms and suites, all air-conditioned and heated. Swimming pool. All rooms have television, radio and telephones. This one is tricky. I cannot find any trace of what happened to the building. It appears to be long gone. UPDATE: Thanks to KoHoSo for bringing to my attention that I have a card in my collection that shows what happened to this location after if ceased to be a Holiday Inn. After hotelier Albert Pick split from the Holiday Inn chains, he rebranded the property under his name. You can see in the postcard above that it is definitely a Holiday Inn layout. There is nothing left of this location. On US 50-N in West end of Great Bend (at 5220 West 10th). Large meeting and banquet room, restaurant with small private dining rooms. Barber and beauty shop; service station; swimming pool. Individual heating and air conditioning; telephones. This located ceased to be a Holiday Inn a while back, but the building is entirely intact. The former restaurant appears to be the office for a storage facility that erected sometime in the 1990s. On US 59 at junction with State 10 (23rd St.) in southwest part of city. Excellent restaurant; 52 air-conditioned rooms with free TV. Holiday Room (capacity 100); spacious lobby; service station; complete hotel service. All new, all the best. This location was torn sometime after 1991. A Days Inn now stands on the site. On US 81 (S. Brodway at Armory Rd., 1 1/2 mi. south of US 40. Swimming pool, terrace, play area. Near Smoky Hill SAC air base and Kanapolis Lake (Federal park project). Complete automotive service. Teletype connection with other Holiday Inns. U.S. 81 – Broadway at Armory Rd. Amazingly, the majority of the former HI is still standing. Not sure when it ceased to be a Holiday Inn, but the Village Inn sign looks like a post-great sign addition, so it may have lasted into the 80s or longer. On US 24 about 600 ft. west of cloverleaf junction with US 75 at north edge of city. Fine restaurant; Holiday Room (capacity 100); heated swimming pool. Free TV in each of the 52 air-conditioned rooms. Spacious lobby; full hotel service. All new! This one is also a bit tricky. Based on the location and the fact there was definitely something with an entrance on this spot, it very could have been here. No matter how you look at it, this location closed a while ago. US 54, East (7411 East Kellogg) just a few minutes drive from downtown and from McConnell Air Base, Boeing, Beech and Cessna plants. Glass-enclosed heated swimming pool. Excellent coffee shop; gift shop. AAA approved. The building was torn down quite a while ago and nothing remains of the old site. US 71, 165, 167 at State 1 (north end McArthur Drive at circle). Easy access to England Air Force Base and downtown. Fifty miles from Fort Polk. Swimming pool. I had a little bit of trouble finding this one. The only specific address(es) I could find said McArthur Rd. at circle. it was probably in this general area. US 61 North, inside city limits. In the heart of the Delta cotton country, 75 miles south of Memphis. A Holcomb Hotel with Admiral Benbow Inn Restaurant, specializing in seafood. Swimming pool, gift shop, sample rooms, Holiday Room for meetings. Enjoy excellent food, in an atmosphere of comfort and convenience. Year-’round air-conditioning with individual controls, swimming pool, TV, advance reservation by Teletype. 24-hour telephone service. 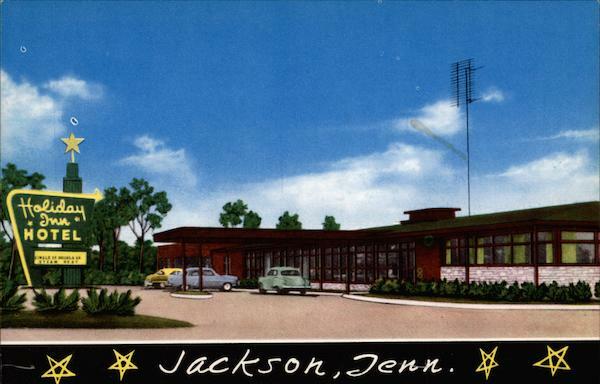 The Clarksdale Holiday Inn was the 5th Holiday Inn to open and the first one outside of Memphis. Hotelier Albert Pick franchised this location as part of his growing empire of hotels and motels. Most of the building is still standing. One of the rows has been torn down, but the covered entrance and restaurant building still stand. One mile west of downtown Greenwood on US 82 and US 49-E bypasses. 100% air-conditioned and steam heated. Phone in every room, TV. Beautiful dining room, convention facilities. Everything for family groups and commercial travelers. Enjoy excellent food, comfort and convenience, in the heart of the Mississippi Delta. Every room has TV and individually controlled air conditioning. Large lobby, 24-hour service, one rate, no extras. I believe this is still the same building. I don’t have a picture of the old one, so I can’t totally be sure. US 11 and 49 South (900 Broadway Drive) just off the Clover Leaf. Swimming pool, restaurant, room phones, convention facilities. Wall to wall carpet, TV, tile baths with tub and shower combination, year-round air conditioning with individual controls. Baby sitters; kennels. Swimming Pool – Air-Conditioned – Restaurant – TV and Telephone in every room. Over the past few years this location has gone through a number of changes. This aerial view shows what once was the restaurant building and the outline of the pool. A little while later you can see the restaurant and pool have been torn down. This more recent street view shows the property has been cleaned up a little and grass is growing where people one swan and ate under the glow of the Great Sign. US 90 on the Gulf, 6 mi. west of Gulfport, 1 1/2 hrs. east of New Orleans. Stable with ten horses, trail rides, lessons for children. Deep-sea fishing. “The Pub,” Lounge, 1500-ft pier for Gulf Fishing. Year-round swimming pool. Fine golf facilities. I am not going to lie to you – this one has had me stumped. If you’ll notice in the brochure, this Holiday Inn has a completely different sign than the rest of them. Information is hard to come by. I believe this may have been the location. Most of the waterfront in Long Beach was destroyed by Hurricane Katrina in 2005. Located within city limits at US highway 61-84 by-pass south. 52 air-conditioned rooms, all with radio, television and telephones. Beautiful swimming pool; delicious dining in moderate priced Coffee Shop. This one did not last long in the Holiday Inn chain. The location is no longer listed in the 1959 Fall directory. It looks like a series of motels occupied the building and lasted for about 50 years. The building is gone now, having been torn down in the late 1990s. However, on the 1996 satellite photo of Natchez, I believe you can see the original structure. Junction US 45-W and Miss. 10 on shortest and best route from Great Lakes area to Gulf, Florida and Southwest. Near Natchez Trace and Columbus USAF Base. Swimming pool; playground and park in connection. Fishing and gold nearby. Fine food. Another tricky location. I cannot find an image of the overall shape and design of this location. The address is fairly vague, too. I was able to find a couple of motels on Google Earth from 2006 that may or may not be this location. This was the seventh location to spring up. It was torn down years ago in the name of the name of commerce. One of the largest locations in the early years with 5 motel buildings and a restaurant. The court was modified in the 70s or 80s and now very little remains of the St. Louis location. NW corner US 29 north and 16th St. inside city limits – 2 1/2 miles from center of city. Featuring 150-seat restaurant, free television, telephones in all rooms, Honeymoon suite. This is one of the most complete locations left. The front building/restaurant is gone but the other two buildings are still standing. South side of US 30 in downtown Canton, Ohio, the last major city you pass through en route to New York City for a comfortable one-day drive via the turnpike. Conference and salesmen’s sample rooms available. This is another location that remains fairly intact. The pool is gone, but you can see the outline to the right of the building. Stony Ridge Interchange of the Ohio Turnpike and Ohio Route 120 (Detroit-Toledo Expressway). 18 minutes SE from center of Toledo – 1 hr. from Detroit. In the heart of industrial Ohio and Michigan. Completely new…entirely superior. This location is mostly standing as well. The pool has been filled in and the current motel looks like it might be in rough shape. 12001 Northeast Urban Expressway on US 66 and 77, one mile west of Turner Turnpike toll gate. Only a few minutes to any place in Oklahoma City. Spacious living combines downtown hotel features with resort hotel luxuries at rates all can afford. Holiday Inn is Oklahoma’s Most Distinctive Hotel. Spacious living combines downtown hotel features with resort luxuries at rates all can afford. Featured are 150 beautiful rooms, year ’round Air-conditioning, 24-hour coffee shop, the beautiful Sirloin Room, Terrace dining. Gift Shop and Swimming Pool. No clue. I cannot find this location. The street address does not exist anymore and the other directions are pretty vague. Leave a comment if you have an idea or know where it was located. On US 17 (Ocean Highway) 2 1/2 miles south of Old Historic Charleston. Restaurant, television, swimming pool, 20 minutes drive to world-famous gardens. Fine golf courses, drive-in theater, ocean beaches, Fort Sumter National Monument nearby. 2 1/2 Miles South of Historic CHARLESTON, S.C.
Another location that I cannot find anywhere on the map. There is no street address and US 17 goes on for miles and miles. I assume it’s gone. US 45 North – on the road to Florida. Near Country Club. Swimming pool, year-round air conditioning, restaurant, convention facilities. Service station, television, wall to wall carpeting, telephone in every room. Plenty of parking space. This one was also difficult to find. I believe that this aerial view shows where the HI once stood. It’s the empty lot on the left side. US 61 South (980 S. 3rd St.) two minutes from center of downtown. Convention facilities for 400 persons. Swimming pool, sample rooms, radio station, shopping center adjoining lobby. Limousine stop for all airlines. 172 rooms. This was the third Holiday Inn to be built. The building still stands but has been heavily modified to become a Traffic Signal Maintenance & Construction supply for the city of Memphis. US 70-79-64 (4941 Summer Ave.) in east Memphis. In the heart of Memphis’ finest residential area, 20 minutes from downtown, within 5 minutes of best golf courses and clubs. Swimming pool, dining room, gift shop. 120 rooms. This is the original Holiday Inn. It opened in the Summer of 1952. The ribbon was cut by the five children of Kemmons and Dorothy Wilson. The location stated with 120 rooms and expanded to 450 rooms a few years later. The location was so successful that the Holiday Inn headquarters were located on Summer Ave. nearby. This location was sold in 1973 and demolished in 1994. An historical marker is located on the site. The fourth of the original four Holiday Inns. The building still stood as of the 1997 aerial view (the red dot and three long buildings). There is nothing currently at that location. US 51 South (2300 S. Bellevue). Ten minutes from Memphis airport. Limousine stop for all airlines. Twenty minutes from downtown. Playground with electric merry-go-round for children. Swimming pool, dining room, 76 rooms. The second Holiday Inn Hotel Court to open in Memphis was located on S. Bellevue Blvd. The sprawling complex contained 450 rooms and a restaurant. The location lasted a little while, but changing neighborhoods and tastes, even in the Holiday Inn brand, caused this location to fall out of the chain. You can see by the aerial view that many of the buildings are still standing. US 60 & 66 (1411 NE 8th) in north Amarillo. Individually controlled year-round centrail air-conditioning. King-size Gyramatic mattresses, room phones, radios, TV. Heated swimming pool. Kiddie Korral. Easy access to downtown. The Amarillo location, built at the same time as the Independence/St. Louis location, opened on Halloween day 1954. It was officially the 6th location in the chain (behind four locations in Memphis and the one in Clarksdale, MS. This is the 1991 aerial view on Google Earth. You can see the shell of the early Holiday Inns. The building would be torn down before the next aerial photo was taken in 1995. This is the site now. US 13 (Military Hwy) just east of junction with us 17, Norfolk county, Va. 10 minutes to downtown Norfolk or Portsmouth. Convenient to Azalea Gardens, historic houses, shopping center. Golf privileges. World’s largest naval base, shipyard nearby. Not sure which one of these locations was the HI. I believe it may have been the one on the far right of the aerial view below. The Alexandria, LA current map is incorrect. That’s the South Traffic Circle. Parts of the old hotel (barely) still stand near MacArthur and LA1 North, on the southwest corner of that interchange. It’s not there for long, though. You can see the tile floors from the bathrooms in that typical horse shoe configuration. Natchez was sold to Albert Pick. Clarksdale was not, it was franchised by Billy Holcomb. The first managers/equity partners for Hattiesburg were Frank and Wilna (not Wilma) Shaw. Long Beach was an existing location franchised by W.D. Jemison who was also 1/3 owner of the Montgomery, AL HI.